At around 9am on any given weekday Peter Brookes sits down at his drawing board in the new headquarters of The Times overlooking London Bridge, near the foot of the Shard. A £14 version of Damien Hirst’s For the Love of God, a diamond-encrusted skull, sits on his desk. He opens a can of Diet Coke, one of the many kept in his small fridge, and starts reading the news. He picks up a copy of the morning’s Times with his cartoon of the previous day and sees how the stories of yesterday have moved on. At 10.45 he walks to the pre-conference meeting, where the newspaper’s editor John Witherow and his senior journalists float ideas before the main 11 o’clock conference, when the next day’s paper is formulated. Come midday, Brookes knows the basic shape of the news. Back in his office he scours the Web for more information on subjects that are starting to work their way though his cortex, lighting synapses, suggesting links, pulling ideas from the vast bank of visual references in his brain. For Peter Brookes (b. 1943), the path to becoming a political cartoonist was unconventional. His father was an RAF Squadron Leader, and Peter followed in his footsteps – briefly. ‘I went into the RAF, wanted to be a pilot, was useless, got flung out,’ is how he puts it. He’d always drawn as a child at school, and he loved the illustrations of Frank Bellamy in the boy’s comic the Eagle, and cartoons in the Daily Mail by Leslie Illingworth. ‘At twelve or thirteen I wasn’t so interested in the political thinking, I just loved the way he drew,’ he told the British Cartoon Archive. He continued to draw during his time in the RAF, but, having considered it only a pastime until his rejection, decided that it was worth a try applying to art school. 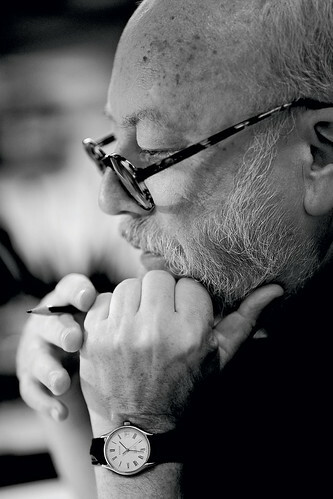 Although lacking qualifications, in 1965 he was accepted on a foundation course at Manchester School of Art, which led to a three-year course in Graphic Design at the Central School. Here, in London, he felt liberated. He also realised that, for him, designing came a poor second to drawing. During Brookes’s studies at Central, David Driver – recently hired as art director to modernise the BBC’s Radio Times, at the time the biggest-selling magazine in Britain – came in to set an editorial project for the graphics students: a health article needing a conceptual approach. He recalls Peter Brookes and Pearce Marchbank (see Eye 44) standing out as particularly enthusiastic and bright students. Driver suggested Peter make an appointment to come into Radio Times with his portfolio. David’s assistant, Susan Maxwell, gave him his first job: a three-part illustration for a radio adaptation of Thomas Hardy’s The Return of the Native. He continued to work as a freelancer, doing covers for New Society and New Statesman as well as working for advertising agencies and publishers. As the work built up, he gravitated towards more politically engaged jobs, items that talked about the state of the world. In 1976 he took over Nick Garland’s slot, doing a weekly cartoon on the political scene for the New Statesman, but gave it up after a short time. Peter Brookes photographed by Philip Sayer. 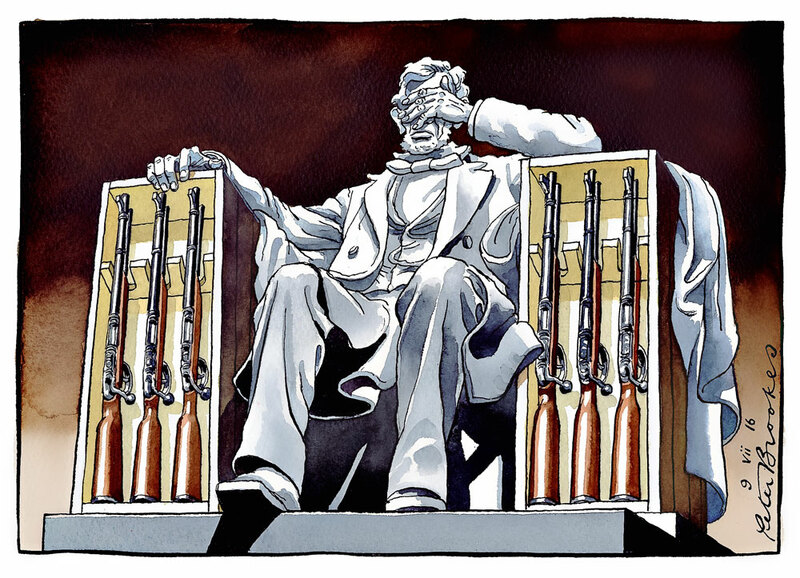 Top: The statue in the Lincoln Memorial, does duty here, brilliantly, for the USA’s troubled relationship with firearms. After mulling over ideas, just after midday, Brookes makes his way across the news floor to the desk of a senior Times journalist – comment editor Mike Smith. Smith is experienced and knows how cartoons work, so he is useful in clarifying Brookes’s thinking, or sparking new thoughts. Back in his workspace (apart from the editor, Brookes has the only office on the Times news floor) he picks up a soft pencil and some layout paper and he roughs out the idea that he has settled on. 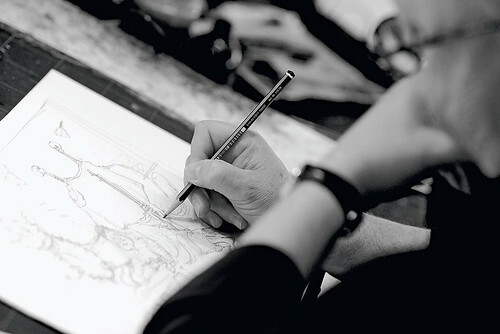 When it is working to his satisfaction, Brookes takes a fresh sheet of T. H. Saunders watercolour paper, and draws – by eye – a rectangular frame. He is aiming for it to be 285 millimetres wide by 200 millimetres deep, his regular slot. He picks up a ruler and measures it. On most occasions it is within a millimetre or two. The sketch is traced down on to the rectangle. Buoyed by this trust, The Listener became an excellent proving ground. However, after a few years, Brookes’s graphics training reared up, leading him to feel that the magazine’s black, white and spot-colour red covers had become, as he puts it, ‘like wallpaper’. He thought that the title no longer stood out on the newsstand. ‘I’ve always had a graphic design strand to my thinking. Ever since I left college, I’ve regarded jobs as problem-solving,’ he says. 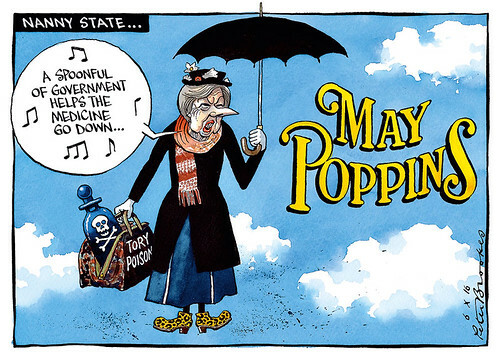 British Prime Minister Theresa May is slotted into a Mary Poppins film poster after May’s closing speech at the Conservative Party Conference in Manchester. Thursday 6 October 2016. It’s 2.30 and Brookes starts the drawing in earnest. It is time for the dip pen, its nib made by the ancient firm of Gillott, and filled with Pelikan black ink. Thus armed, he begins the process of creating a vicious likeness of today’s target, probably in a position or pose that will reveal their most craven impulses. Years of practice have made him a master draughtsman – there’s no time wasted on worrying about likeness or perspective or scenery, and he has access to the photo library at The Times for any details he is unsure of, whether that is a rock musician’s stage costume or a prison warder’s outfit. He will also call up the reference images he is parodying. There is a joy in the research that makes the title for The Godfather perfectly mimicked, or the perspective of the subway entrance by the House of Commons so accurate. Such research also plays to one of Brookes’s greatest strengths: yoking together two totally disparate news stories – the Greek debt overlaid on a pop singer’s death, or an oil tanker run aground crossed with a politician’s promise. When Peter Stothard was made editor of The Times in 1992 and offered Brookes the chance to try again, he fully committed and gave up other freelance work. Thus began a long and extremely fruitful relationship (24 years and counting) between the ‘paper of record’ and the pen of Brookes. 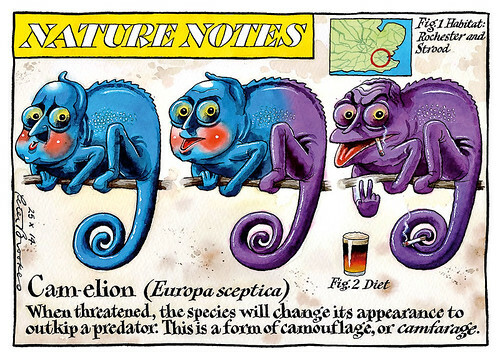 Cameron featuring again, this time in ‘Nature Notes’, morphing into Ukip leader Nigel Farage, Saturday 25 October 2014. Brookes says: ‘David Cameron has that wonderful Tory face that I’m sure he polishes each morning after brushing his teeth – he glows privilege. In the quiet of his space – ‘I need quiet, I can’t draw with a racket going on’ – he sets to work. Everything now is at Brookes’s disposal to make the most of the conceptual joke, to make it sing, and to make it sting. The watercolour adds a powerful intensity to the line work, and it is applied with a master’s touch. A small travel hairdryer now comes into its own as a key piece of kit, speeding the drying of the paint that Brookes applies, working layers quickly over one another. Times editor John Witherow will not see the cartoon until it has reached its finished state. So as soon as the last brush strokes have been given the hairdryer treatment, Brookes walks from his office to the editor’s to show him tomorrow’s ‘oasis of anarchy’ (in the words of fellow cartoonist Martin Rowson, quoted in ‘Ambition and illustration’ in Eye 92). He then takes it along to the imaging department, who will scan it and let him do colour corrections. This last job done, he pulls on his hat and coat and heads home, not knowing what the news will dish up overnight. 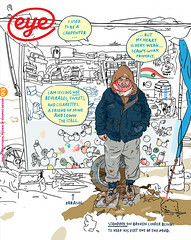 As the great wartime cartoonist David Low once said, ‘Cartoonists are the permanent opposition,’ to which Brookes adds, ‘It’s true – there’s no such thing as a political cartoon in praise of something!’ As Times journalist and former MP Matthew Parris says, ‘His target is rarely the ideology of one politician or another. It is the vanity, inanity and mediocrity of the whole damn lot.’ His work can be vicious but there is no interference from above him at The Times to tone it down. Peter Brookes and I spoke early one morning in the weeks following the UK ‘Brexit’ referendum. The ensuing chaos in UK politics had ushered in a period where big stories flared momentarily before an even more extraordinary story shoved all else aside. He looked energised and mischievous and ready to begin his working day. I pondered which would be worse as a politician – to face a rival across a despatch box, or to be in the crosshairs of Brookes’s pen. It did not take me long to decide on the wisdom of choosing the despatch box. Brookes roughs out Tony Blair in pencil, pictured playing a supporting role in British PM David Cameron’s Libyan problem.